Gift of Life Transplant House, a beacon of hope, was established 35 years ago. It serves as a home away from home for approximately 4,500 patients and their caregivers who stay there while going through the transplant journey. They may be receiving or have received a life-saving organ transplant (such as heart, heart-lung, pancreas, liver or kidney), stem cell transplant or bone marrow transplant. The house also welcomes patients receiving CAR-T therapy, which is a procedure that helps treat certain types of cancers, such as leukemia and lymphoma. Executive Director Mary Wilder brings lots of experience and enthusiasm to her position. In 2017, after holding leadership roles with increasing responsibility, Wilder relocated from the Twin Cities to take the reins at Gift of Life Transplant House. Having donated a kidney to her father several years ago, she says it seemed like providence when she learned of the position. 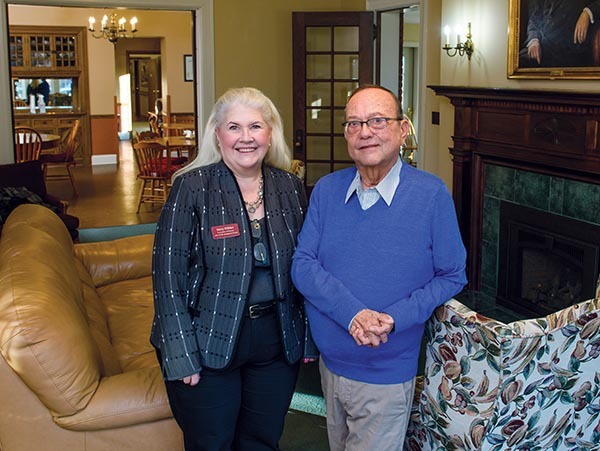 Thirty-five years ago, Rochester resident Ed Pompeian had the idea for Gift of Life Transplant House to aid transplant patients in their recovery, as he himself is a recipient of two kidney transplants. April is National Donate Life Month. The main objective of National Donate Life Month is to raise awareness and encourage people to become organ donors. Throughout the month, there are a number of events planned here in Rochester. Some highlights are The Walk of Remembrance, to commemorate donors and recipients, which starts at Saint Marys Hospital and ends at Gift of Life Transplant House. The Timmay 5K—in honor of Tim Rasmusson, a young local man who passed away at 26 years old, ultimately donating several organs—is always held the last Saturday in April. Funds raised from the 5K help support Gift of Life Transplant House. Another highlight will include the unveiling of a Donor Honor Wall at the Gonda Building. On Dec. 10, 1984, Gift of Life House opened its doors to transplant patients in Rochester. Thirty-five years is a long time to make an impact in the lives of transplant survivors around the world. In honor of this milestone, Gift of Life Transplant House has events planned for nearly every month in 2019. In July, the 35th Annual Golf Tournament will be held at Rochester Golf and Country Club. Gift of Life Transplant House will cap off the year with a special celebration planned for Dec. 10, 2019, the official anniversary date. For more information about Gift of Life Transplant House and the numerous exciting events planned for 2019, visit gift-of-life.org/calendar-events. Cindy Mennenga, owner of MedCity WordCraft, LLC is a freelance writer and editor based in Rochester. This entry was posted in Community on February 20, 2019 by Cindy Mennenga.